For 51 weeks of the year, the 16th hole at TPC Scottsdale is a placid stretch of 162 yards that serves as an uncomplicated par-3. 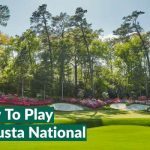 But come Thursday, some 20,000 rowdy fans will cram into the surrounding suites and grandstands to transform it into what Aaron Badley dubs “the most intimidating hole in golf”. 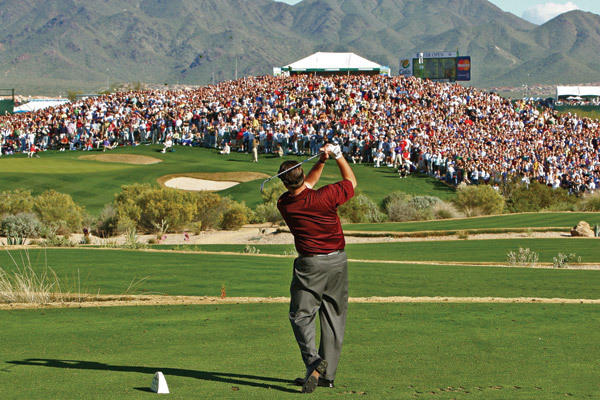 The PGA Tour heads to Arizona this week for the Waste Management Phoenix Open, a tournament which drew 526,000 fans last year and is routinely the most-attended golf event of the year on Tour. 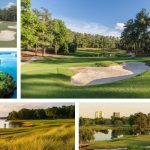 Without question, the hot spot and chief drawing card of the week is the 16th: golf’s ultimate party hole. The golf clap does not play here. Completely enclosed by 192 two-storey corporate skyboxes (up 20 from last year) and grandstands, players enter through a long, dark tunnel to a raucous reception, often fuelled by libations served at nearby beer vendors. Caddy races have been a regular feature at the infamous 16th … until the PGA Tour banned them at the end of last year. You need either thick skin or a strong nerve to escape here with your dignity in tact. 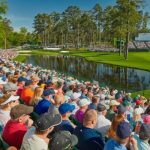 The 20,000 or so fans who surround the hole each day of the tournament are part of the show, roaring the split second after a player makes contact with his ball. As the ball plunges toward the green, they ready themselves for a boisterous opinion of the shot. Ian Poulter felt the love after sticking his tee shot close during the tournament’s 2010 edition. The Englishman cupped his ear and applauded the crowd before stepping up to his birdie putt. But as he shortly found out, this crowd is a volatile bunch. Poulter missed his five-footer. Merciless heckling ensued. Then he responded in typically brash fashion, offering the booze hounds a sneaky one-finger salute disguised as an apparent “nose rub”. The loudest the hole ever got was in 1997 when a then 21-year-old Tiger Woods made an ace with a 9-iron and thousands of beverage cups rained down on the group of players and caddies. Raising the roof … Tiger sends the Scottsdale crowd into pandemonium with this ace at No. 16. “We had flying debris coming in after I made it, and I think I was the first person ever to raise the roof for a shot on the PGA Tour,” Woods said. “It was so loud. We couldn’t have had it any more loud than that because obviously Super Bowl was that weekend. Everyone was coming out there. Sadly, Woods hasn’t played at TPC Scottsdale since the 2001 Phoenix Open – the same year that a fan lobbed an orange onto the green while he was putting. Woods, who missed the Saturday cut of the Farmers Insurance Open thanks to him equalling the second-worst score of his professional career (79) in an extraordinary implosion, flew to Dubai on Sunday ahead of this week’s Desert Classic. But for the 129 others set to tee it up in Thursday’s opening round in Scottsdale, the party is about to begin. Fond spectator and student of the game. Always on the look out for a winner. Proud owner of a 'caveman' swing and some of the worst attire ever donned on a golf course.